Ustream is a leading live interactive broadcast platform that aims to bring people together around shared interests for live interactive experiences. The company attracts millions of users from around the globe ranging from artists to celebrities to music enthusiasts to corporate executives. As a live and interactive video streaming site, Ustream is always looking for ways to improve their user experience. Part of their ongoing improvement process entails the development of new user interface design elements, each with specific goals in mind. When they launched an opt-in beta site for early adopters which had multiple proposed layouts. In order to determine the optimal layout for their desired visitor engagement, they needed to gather intelligence about how each layout would drive visitor interactions. A button in the header of the new layout provides the ability for Ustream’s broadcasters, or soon-to-be broadcasters to launch the web-based Broadcast Console. Ustream wanted to optimize the new layout to maximize the number of broadcast sessions initiated from this button. Two different proposed button designs surfaced as a viable solution to the layout challenge. The team was divided on how to garner the most broadcast sessions with a button change. They assumed that as a multilingual site, a lone camera icon would sufficiently drive new sessions. The team thought that adding the word “Broadcast” next to the icon might also be necessary; however, they wanted to save as much space as possible, since the header is a valuable part of their screen estate. Using Optimizely, Ustream set up an A/B test pitting each of the proposed button designs against each other. The Ustream team set up a click goal on both buttons in order to measure the number of broadcast sessions that each button design yielded. After exposing the test to just over 12,000 visitors, a statistically significant winner emerged, and the uncertainty could be resolved with data. 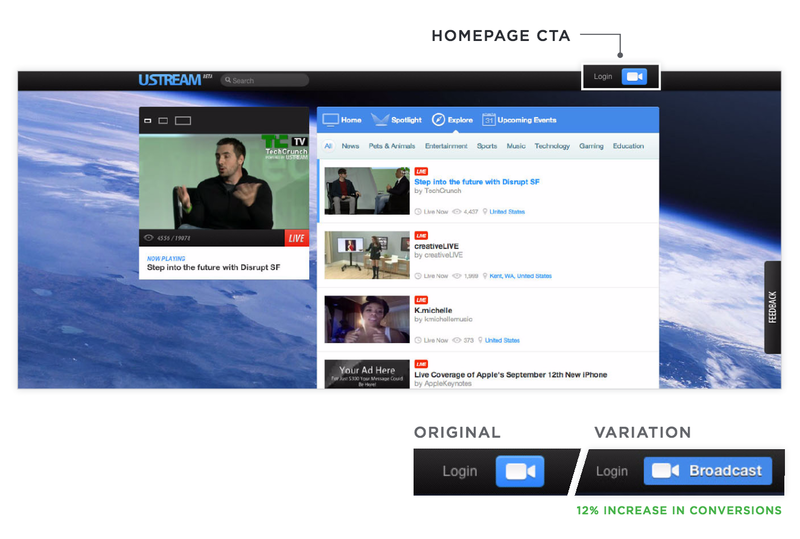 Ustream tested the main call-to-action button on the homepage of their opt-in beta site to determine which design would garner the most clicks. The text and icon version was 12% more effective in achieving the desired result for the Ustream team. With Optimizely, Ustream was able to quickly measure the impacts of two potential designs prior to rolling them out to the entire Ustream user community. After running the test for four days, they were able to find a clear winner and ensure that the optimal design was being implemented. Rather than acting on hunches or feelings, the team could confidently assess and measure the value of their work. Trust your intuition, but don’t forget to measure. With Optimizely setting up an experiment like this is very easy and was up and running within a half an hour.